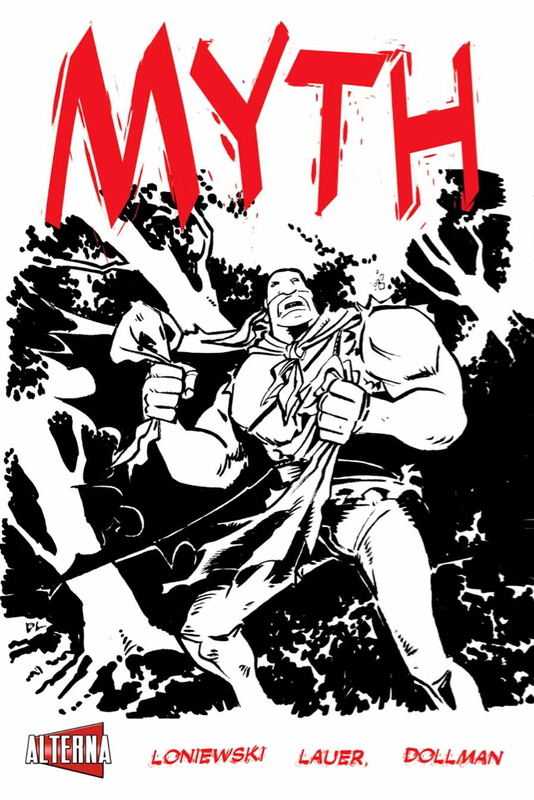 The final part of the Myth trilogy is now available (here are our issue 1 and issue 2 reviews), and I’m pleased to report it’s a satisfying conclusion. The story continues along with Sam abducted and needing rescuing, but that is primarily the backdrop to a number of other events that culminate in the final scenes. I’ve mentioned the Bone echoes for me with this title, and I definitely stick with that belief after reading issue #3, and I see that as a very positive thing. As mentioned both times previously, all proceeds go toward Childhelp.org, so jump in and buy all three if you haven’t read them until now. 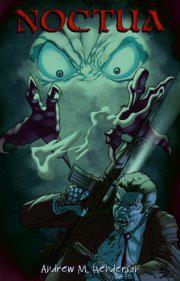 Issue #3 is slated for release on the 19th February over at Comixology. C’mon, what are you waiting for?? 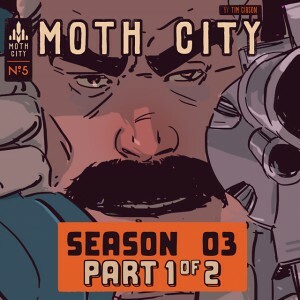 Moth City is almost completely unrecognisable from where it began. 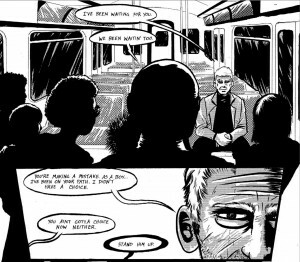 While writer/artist Tim Gibson warned us, introducing this series as a blend of film noir, horror and the Chinese manhua, but nothing could prepare fans for how much horror it would manifest. 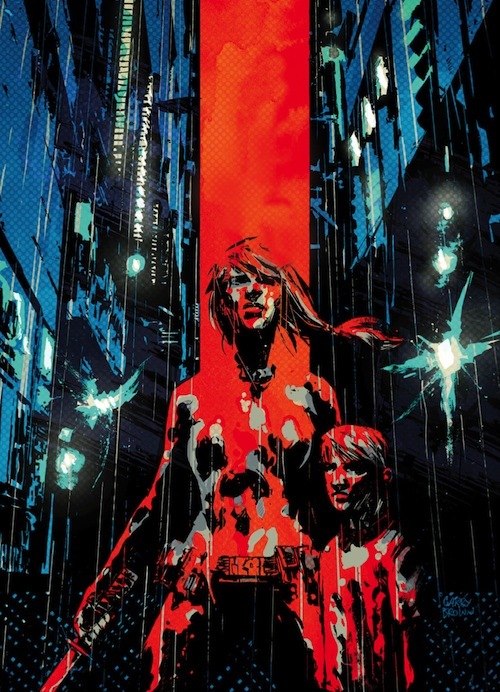 This issue twists the doomsday clock that much closer to midnight, blending pulp zombie fiction and family drama in a way that teases a tipping point so exciting, that readers sticking to the Comixology releases are going to have a hard time waiting. Moth City may be unrecognisable, but that doesn’t mean it isn’t better. Gibson is right at home in the horror genre. His art style is suitably grimy, with his almost grind-house infused colour palate a perfect compliment to the blood and gore that features throughout. Again, he manages to impress with his panels that infuse motion, and his characters have become more detailed as the series has gone on. Gibson appears to have become more comfortable with the series as it has progressed, and this issue gives him plenty of opportunities to showcase that. Speaking of characters, allegiances also have been drastically challenged since the series began. No longer is Governor McCaw a typical American tycoon, but has been built up as a father who ultimately cares for his daughter, and will stop at nothing to save both his island and family. Also a great touch is Jun, a man battling with the smart-zombie infection (all the hunger plus all the brains), whose own desire to protect his wife outweighs his want to eat her. It’s a nice play on the zombie tropes, and will definitely set up some cool moments before the series end. 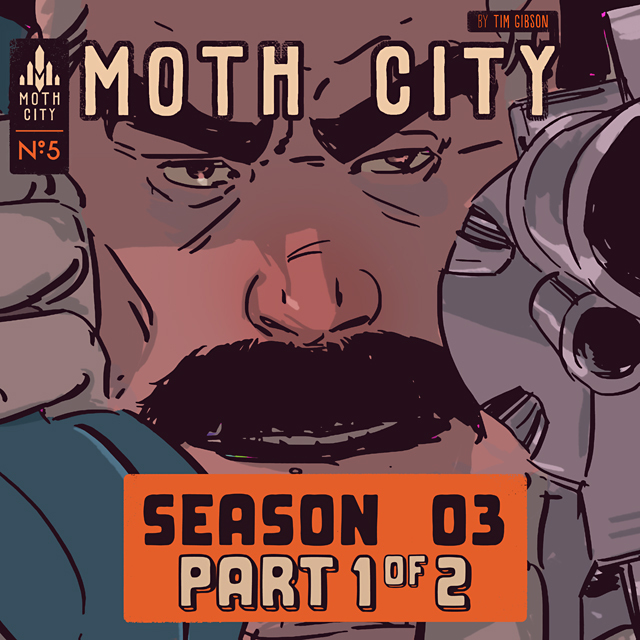 And the end is near – only three more issues of Moth City remain, as the island hurtles to fever pitch. Just make sure you get on this series now, because it’s going to be a great ride. Superheroes as a form of celebrity culture isn’t a new thing. Many examples come to mind: DC’s Booster Gold, Mark Waids Insufferable, each dealing with the other side of being a superhero – making money. But neither title really tackles the corporate culture head on – well not like Super Corporate Heroes. It asks a completely new question: what if superheroes were on a payroll, and would only save you if you paid up? Miguel Guerra and Suzy Dias provide this take on the superhero culture, and while it falls victim to some minor flaws, it becomes something fairly unique to the genre. As mentioned before, Super Corporate Heroes follows a group of superheroes under the payroll of Superhero Inc. These are men and woman who don’t do it for the altruism – this is for fame and fortune. The series follows the day to day lives of these heroes – the sleazy, arrogant American Icon, the woman of steel Ms.Titanium, the somewhat anatomically correct human spider known as Spinlar – each of these heroes fulfill an archetype from many of the big two publishers’ rosters. While at times they are amusing parodies, like Spinlar ,who spins his web from his back side, other times they can be quite blatant, like the Wolverine-esque Meerkat, and the less than subtle references become more of a distraction than bringing anything to the table. Despite this, Guerra and Dias manage to create a well-rounded cast of characters that at times elevate things higher than simple parody. Where this comic really shines is the situations these characters are placed in. While at times the moment-to-moment dialogue feels uneven, jumping from 1960s hammy to more modern characterisation, the events that take place are often a treat. From the victim of a mugging who is torn between being mugged (which is cheaper) or paying up to the local hero to save him, to the disgust a bank has toward being saved by Spinlar, the moments can be incredibly amusing to see play out. At times the themes move on from simple satire, to deeper exploration of economics in our society. Questions of equal pay between male heroes and female heroes, lack of funding to more basic emergency services, and small businesses unable to pay insurance are all brought up. It’s a welcome depth to the idea of a corporate culture and superheroes, and while these really only get touched on briefly, it’d be great to see more of these topics dealt with as the miniseries moves on. The art on the other hand is a mixed bag. While it certainly invokes strong ties to the square-jawed, simply designed heroes of the Silver Age, the detail in the facial features appears a bit off. Faces seem to be oddly placed, and occasionally characters are contorted in such a way that looks weird. Backgrounds are also lacking, keeping to a bare minimum of detail, and never really giving the comic a sense of place outside of generic city-scapes. The art overall isn’t bad, but it never becomes anything more than a fairly simply drawn book. Super Corporate Heroes surprised me, and that doesn’t happen too much these days. Its relevant satire of the global economy elevates it higher than many other comics in its genre, to create something that both entertains and intrigues more than you’d think. One of the highlights of running this tiny ship called the Comics Herald, is getting to review comics that I would never have potentially stumbled across otherwise. One such example is Zoe: Out Of Time. Written by J. Michalski and Alexander Lagos, with Derlis Santacruz on art duties and Oren Kramek on colours, on the face of it this is a boy meets girl time-travel story. And that’s exactly what it is, but it’s done in a fresh enough way to make it a fun read. Zoe is living in the year 2050 and is obsessed with a band from the 1990s and thanks to having a scientist dad who happens to have worked out how to travel in time, she heads back to 1990. It takes all of Issue #1 to set that up but it’s done in an entertaining enough way that it doesn’t make the story feel like it is waiting to start. In fact, I probably enjoyed Issue #1 more than #2 as once Zoe arrives in 1990, things get a little bit formulaic there for a while but the pace picks up toward the end. The art is engaging and actually reminded me quite a bit of The Second Life of Dr Mirage, though on checking back on my issues of that the comparison isn’t totally valid. If I had to make a criticism of the colouring, it’s the heavy reliance of one-colour backgrounds that dominate a page or series of panels. Sometimes that’s exactly what you need for particular settings, but to me it seemed to dominate the whole book. Overall I’ve really enjoyed the first two issues and I’ll be keeping an eye on the series. If you’re after another good independent digital comic to jump on, then give this one a go. Find out more about Zoe: Out of Time over at their website. I’m just going to come right out and say it. 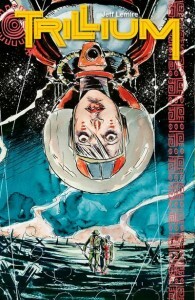 Jeff Lemire is one of the best writers/artists on the comic market today. Each of his creator-owned works – Sweet Tooth, The Underwater Welder – have been some of my favourite stories in the past few years, so I know that when a new series comes around, you pay attention.Thankfully, my want for the next big Lemire-story has paid off, because not only does his new sci-fi epic Trillium hit a home-run, it hits it right out of the park. Trillium – billed as the “last love story ever told” – tells the story of two different people, from two different places in both time and space. In fact, this first issue is told in two parts – one set in the year 3797, following scientist Nika Temsmith, and the other set in 1921, following William Pike, as he searches for the Lost Temple of the Incas. How these two meet is the crux of this tale, so I won’t spoil it here, but it is safe to say the mystery behind the why/how/who of this event is going to be a great one. Lemire does more work in 14 pages than most writers do in 23, as he splits the issue right down the middle and they meet in the centre. Each story and world is well fleshed out, and Lemrie never seems to waste any space, proving that this is a man who most definitely knows his craft. Pike’s half of the issue is easier to digest, because of his more earthly origins, but it doesn’t make it any worse. In fact, it is a smart move to have half the tale grounded in a closer reality to our own, as it becomes easier to identify with Pike, as he battles his own war-time demons. That’s not to say Nika’s part of the tale is too hard to digest – a mysterious virus is slowly wiping out the human race and they find themselves more and more on the run. There is a true sense of the end of the world in her half of the story, that is both poignant and interesting, and it extends further than a lot of similar fiction does. As always, I am a huge fan of Lemire’s art style, and combined with his old collaborator of colouring Jose Villarrubia from Sweet Tooth, it really nails it here. The people are wonderfully expressive and the watercolours make for a beautiful read. While, again, Lemire’s surreal art style isn’t for everyone, it really helps set the mood, and Lemire knows how to tailor a story to his own work. Trillium is, to no surprise to anyone, brilliant. I don’t feel I have to say anymore than Jeff Lemire’s name these days to pique anyone’s interest, but if you’re looking for a story that feels unique and from a man who knows his craft, look no further than this book. Circus: The Graphic Novel – Get Inside The Show! The greatest circus on earth becomes the most desperate after its main big top, filled with technological and artistic marvels, burns to the ground. With performers dead, acts cancelled and a world war looming, violence, crime and risqué entertainment are embraced as necessities for the survival of the circus. What I like about the different pledge levels is the variety in options for you to be featured in the book itself, whether you’re an artist or just someone who’d like to see a character that looks like them. It’s only a day until the pledges close and it’s looking like the project will meet target if a few more people throw their hats in the ring. We’ve happily pledged and I’m looking forward to seeing the finished product in January 2014. Go check it out for yourself. Wolves of Summer is quickly becoming something I look forward to (that makes two of us – Ed). The two months between issues seems like a long time, but after the second issue, it’s going to feel a lot longer. “Knives” keeps the momentum going, as Johnny tries to turn a young group away from a life of violence, and in the past, the Wolves find themselves dealing with their own demons. Hans’ demons in particular are a stand-out. Waking up Johnny in the middle of the night, and telling him to kill the weakest child in the group is particularly chilling. Spending the rest of the issue on edge was effective, and really hits home a Lord of the Flies parallel, only for it to end in a way I didn’t expect. It only deepens the relationship between Johnny and Hans which is interesting, and I hope to see it pan out more. Another child plagued by demons, this time in a more literal sense, is Hartschen. His failing sanity, as he is visited by monsters is also interesting. Even when the monsters aren’t around, it’s clear that something is up, as Hartschen attempts to wind-up other kids without provocation. Not only does it question what is going through his mind, but it is also a very childlike thing to do, as when the boredom sets in, anything will do for fun. 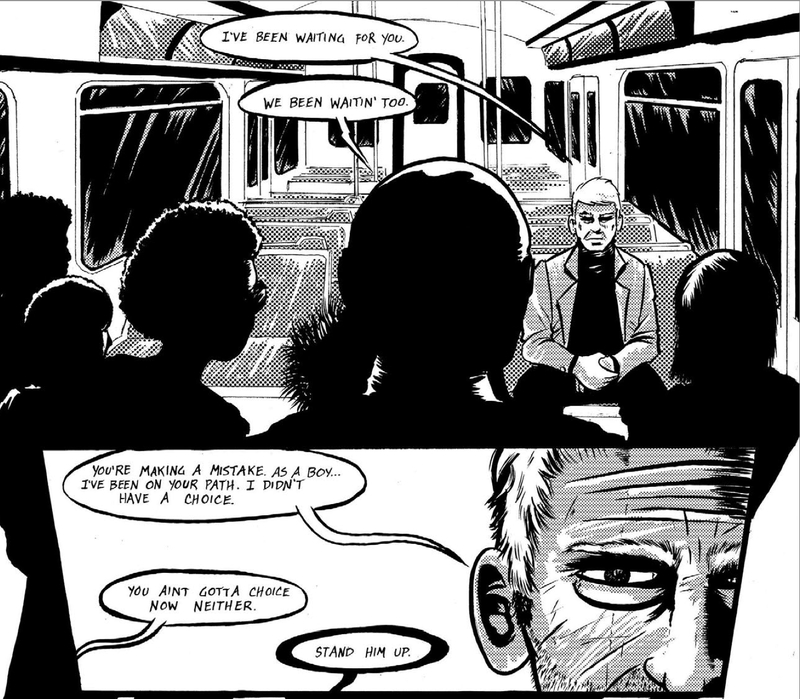 The future storyline is the weaker part of the issue this month, as it mostly focuses on action as Johnny tries to turn the children on the train away from attacking again. While it did subvert my original theory that Johnny was trying to die, the execution mainly consists of a well drawn action sequence. It is book-ended with two very powerful moments, but the parts in-between feel like filler, and also makes for a confusing question. If Johnny really wanted these kids to go home to their family, would he have really fought back the way did? I hope the way he handled the situation is explained further in future issues. As mentioned before, Herbst again shows off his artistic chops. The strong visual storytelling returns, as does his fantastic panel design. The monsters in the forest are also effective, as his art style lends to their horror effectively. His unique style is a treat to read, and the action scene has a strong sense of motion and momentum. I can’t wait to see where he gets to go next. In fact I can’t wait to see the rest of this series goes. While I may have already used that praise in my first review, it can’t be said enough. Tony Keaton and Andrew Herbst have struck gold with Wolves of Summer #2, and it has quickly become one of my most anticipated series. The next issue can’t come soon enough. You can buy it here. A while back I reviewed Issue #1 of Myth. I gave it the big thumbs up then and I’m pleased to say issue #2 is at least as strong as its predecessor. It continues the story of Sam and his silent giant friend as they settle into their existence together. Not content with having changed things for the better in the first issue, Sam’s decided they’ll continue to right wrongs, which is where things start to get complicated for them. 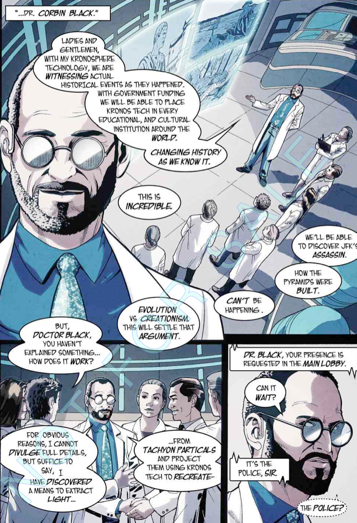 I like the work Mike Loniewski has done on expanding the scope of the story, to the point I wonder how well it can be wrapped up in a 3-part mini-series. Dan Lauer’s art is fascinating in this issue: his minimalist style appeals to me but to mix things up a bit he changes style a couple of times, including some charcoal sketch work by the look of it, which is lovely. There’s the odd series of panels that seem a little rushed to me but overall I love the feel the art delivers. As I mentioned last time, all proceeds (the comic is initially free as a preview) from the comic go toward Childhelp.org, with whom the creators have partnered. That alone may be worth spending some money to support but I can tell you that this is a great read and I’m certainly hanging out for the conclusion in issue #3. Myth #2 hits Comixology on the 29th May so go check it out and help a good cause at the same time. One of the things that has amazed me in the months that The Comics Herald has been running, is the level of quality in independent and smaller company comics. My colleague Sean reviewed Hoodlum #1 from Hilary Goldstein back in March, and he’s back with a very different title this time. The Golem #1 is also from Alterna Comics and is a 4-part mini-series launching tomorrow on Comixology. The story is set in a future Paris and centres around a mother (Danya Ben-El’azar) and her son Jonah. The mother just happens to be a highly trained former covert military type, and her young son works alongside her to form the team know as The Golem. Danya’s a good-hearted vigilante who’s willing to shed some blood where needed, and once her back-story is revealed you can see why she’s in that position. The back-story itself is efficiently told and holds interest throughout. The overall story arc is interesting and I’m definitely keen to see what happens after the first issue’s cliffhanger. The backdrop of Paris is also well written in and provides some great ambience to the story, plus it’s great to see a story like this set outside of the United States or a fictional city. The dialogue is crisp and moves the story along nicely. I’m actually caring about Danya and her son and I like that their lives are painted starkly, reflecting the ambiguous situation they are in. Art-wise, I love Giovanni Timpano’s work here – it’s a perfect fit for the story and he does a brilliant job of defining key locations with colour (the purples for the safety of home being the more obvious one). It’s just plain nice to look at throughout and Garry Brown’s cover is worth hanging on a wall. 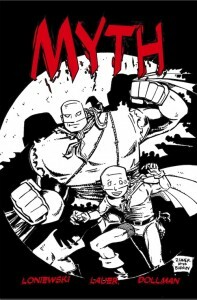 The Golem is off to a cracking start and I’m hanging out for #2 before #1 even hits Comixology. I also regret I was unaware of the Kickstarter campaign that got this book made – I would have more than happily kicked in for a TPB of this. So do check it out on Comixology tomorrow – it’s a very engaging read indeed. At one point it seemed vampires were everywhere – they had the seat that zombies had once occupied and were intent on being a part of every form of media. Now that the “Twilight madness” as I liked to call it, has calmed down, zombies have returned to being the supernatural creature of choice. Noctua fills this void of vampires, by producing its own take on the monster, mixing in elements of racism, mob drama, and a little bit of Batman to create something unique – if not a bit rough around the edges. Noctua is set in 2051. Vampires (known in this universe as trans-humans) and humans co-exist tentatively, with strong xenophobia extending from both sides. After an owl-like vigilante known as Noctua raids an illegal human blood trafficking ring, killing a mob boss’ son in the process. He finds a young girl and takes her in, and as news of Lucinius death reaches not only the leader of the mob, Alucard Constans, it also reaches a couple of police detectives as well, who take it upon themselves to find out what went wrong. If that synopsis seemed like it had a bit much going on, it’s because the first issue kinda does as well. Henderson introduces many different plot-lines without letting the reader having time to grasp the previous one, as the story bounces from character to character without slowing down. I can’t help feeling that this dialogue heavy issue would have been better spread out over three, letting the reader take in bits and pieces, and giving more time to flesh out the character of Noctua, before throwing in the rest of the world. Where Henderson does succeed is in his portrayal of vampires. Less monsters of the night, and more like the X-Men, Henderson manages to make this new race sympathetic. They are just real people, some are good and some are evil. At the end of the issue, I’m not entirely sure whether I should be rooting for Noctua, who initially comes across as a more violent Batman, only to seem more like a killer with a personal vendetta against a race, rather than someone who seeks justice. It’s a nice twist on the vampire fiction, and it seems to set up future moral conflicts for the characters of this world. On the subject of Baez art, it’s a bit of a mixed bag. His character work is fantastic, with the vampires looking suitably feral and savage, and thanks to Eagle Gosselin’s dark colour palate it sets a depressing and violent tone. But Baez environments at times lack any detail at all, never quite giving the comic a sense of place. I could never tell where exactly the action was taking place, and often the background was just a swirl of colours, leaving me to guess where the characters were, or if they were even inhabiting a physical space at all. Noctua comes out of the gate swinging, introducing many different plot points that can leave it feeling cluttered, but thanks to it’s interesting premise and themes, still manages to keep me interested. If this book manages to slow down and focus on only a few plot-lines, this could definitely be one to watch this year.